Everyone wants to know how to use blog posts to drive traffic to their site, how to make their blog posts more viral. 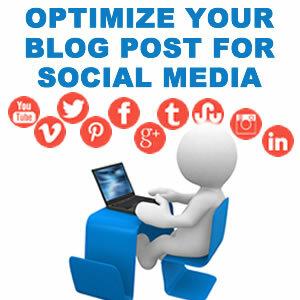 A key component is to social media optimize (SMO) your blog posts. Social Media Optimization (SMO) is optimizing your website and content to increase sharing on social media sites. 1. Have Unique, Informative and Helpful Content. Doesn’t matter what your industry is people want to know what your product or service can do for them – “How can I …”. Write blog posts that showcase your benefits and answer questions. It’s true an image is worth a thousand words and in this case maybe a thousand shares? On average images are 39% more likely to get more interaction on Facebook than regular text. Use relevant good quality images with each post. 3. Why Not Use Video? Video marketing is the next big thing because it works. Posts with video attract 3 times more visitors and video is shared 12 times more on Facebook. Also using video increases your chance of page one listing on Google by 53%. How can you turn your blog post into a video? Encourage interaction with social media share buttons. Ensure that your blog includes social media share buttons and the most popular areTwitter, Facebook, Google +1, LinkedIn, and Pinterest. Don’t forget to posts your images, video and blog posts to your social media accounts. Last but not least Social Media Optimization helps with Search Engine Optimization. Posting to social media helps get your blog posts indexed faster. Shares, likes and +1’s give signals to search engines helping to increase your ranking. And having your posts go viral may help to increase your in bound links. Don’t forget to search engine optimize your posts. Social Media is a great way to get your blog posts in front of potential clients. The key is to practice social media optimization on every blog posts.